The report is released by World Economic Forum. The report ranks 115 economies on their ability to balance energy security and access with environmental sustainability and affordability. Sweden has been ranked on the top and is followed by Switzerland and Norway. Countries around the world are upping the share of renewables in their energy mixes but not doing it quickly enough to meet the Paris Agreement goal. The report says in order to achieve a stable, sustainable and affordable global energy system will require a collaborative and systematic approach to solving problems and exploiting opportunities such as new technologies of the Fourth Industrial Revolution (4IR). The report says despite the diversity of top-performing nations in their primary energy mix, systems and resources, they all share certain characteristics, demonstrating a combination of technical advances and effective policy-making and implementation. 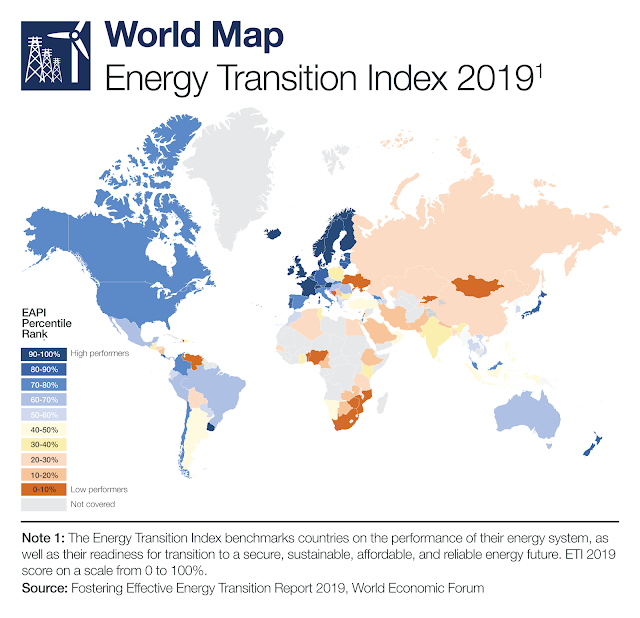 Countries with high scores performed well on their readiness for energy transition. Countries at the bottom of the ranking often lack effective regulatory frameworks and suffer from political instability. Despite high contribution from energy sector to economic development and growth due to large fossil fuel reserves, Nigeria has been ranked in the bottom 10% of countries in the report, with low overall system scores and lack of enabling infrastructure. 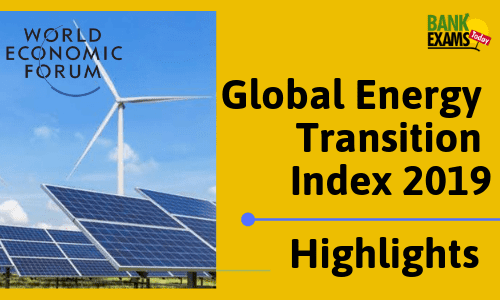 India moved up two places to rank on 76th on Global Energy Transition Index 2019 which was ranked at 78th position last year. The country is also amongst the countries with high pollution levels and has relatively high level of CO2 intensity in its energy system. India scored low in terms of system performance (ranking 97 and 86, respectively), it ranks considerably higher when it comes to readiness (45 and 61, respectively). In the BRICS block of emerging economies, India is the second best with Brazil being the best at 46th place globally. India is the only amongst the five economies that had improved its ranking since last year.